Since French is the language of love, it's only natural that the French language provides many famous love songs. 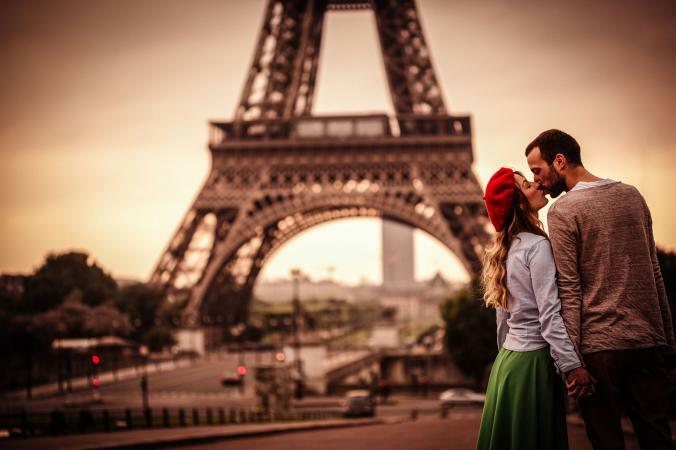 Here is a list of ten of the most famous French love songs of all time. Listen to one (or several!) the next time you want to create a romantic mood. Whether you want to seduce your lover or you need some inspiration, French love songs make great easy-listening. Whether you like older music or newer sounds, there's a romantic song to suit your tastes. Here are ten all-time favorites. Édith Piaf is considered to be one of France's most beloved singers. Of Algerian and Italian descent, she is the queen of French love songs. While many other men populate the top ten list, Edith Piaf is one of the few women. One of her most famous songs, L'Hymne à l'amour, is as haunting and as beautiful as the tale that inspired it. While Édith Piaf wrote the lyrics to this song, Marguerite Monnot composed the music. It has been reported Piaf wrote the song for her husband, the French boxer Marcel Cerdan after he died in a plane crash. The song was so popular it inspired a novel and has been covered by a variety of artists. Often referred to as the Elvis Presley of France, Hallyday's career included a lot of rock and roll music, as well as his ballads. Que jet'aime topped the French charts for 11 weeks in 1969 as the most popular single sold, and topped Belgian charts, as well, as the most popular song. One of the most famous French singers of the chanson style, Aznavour's hit, Mourir d'aimer, is about dying for love. He claims there is no greater value in life than to pay for one's love with life. Intrinsically linked, you can't separate life from love, which is why this song's lyrics and soulful sound became such a hit. He won the Gold Lion Honorary Award (Venice Film Festival) for the Italian version of the song. A singer and actor, Yves Montand was one of the greatest stage and film stars of the middle part of the 20th century. Car jet'aime is a serious love song, but with the frequent repetitions of words, a playful nature lightens the atmosphere compared to some other love songs of the same period. Montand was prolific, making numerous movies and singing a variety of songs. He was the first music hall singer to sing at the Metropolitan Opera in New York City. Born in Senegal, raised in France, and influenced musically by a journey to Egypt, MC Solaar is one of France's best-known rappers and hip-hop artists. Caroline is a poetic song featuring imagery and wordplay surrounding the idea of playing cards and gambling. The song echoes the feelings of a strong love that has now ended. The song stayed in the top 20 on the French hip-hop charts for 17 weeks, peaking at the number four position. Baker, born in America but becoming a French citizen after a decade working in Paris, J'ai deux amours was her anthem. The songs lyrics claim: "I have two loves: my country... and Paris." While some Americans believe Baker was referring to her country of birth in this song, the French almost unanimously believe she was referring to France. In any case, the song became an anthem in France while Josephine Baker's career spanned an impressive 50 years of performance in Paris and around the world. It has inspired a whopping 25 covers by other artists. Born in America, but living in Europe for much of his adult life, Joe Dassin topped the charts in France with songs like L'été indien. About love during the Indian Summer in North America, this song will appeal to all who have a romantic image of autumn in America. With its sultry sound, it topped the charts in France in the 70s. Another hit song by the lovely Edith Piaf, La vie en rose is slow and sensual, making it perfect for Piaf's iconic voice. She wrote the song and first recorded it in 1946, although she was unsure if the public would like it. It was such a resounding success that the song has been sung by more than 50 additional artists over the years. Even for those who don't speak French, Ne me quitte pas is clearly a deeply moving song. Dripping with emotion, the singer begs his love not to leave him. Promising everything he can offer under the sun, Brel makes a strong case in music. It is widely considered one of his top songs. Hitting the charts in 1979, Je l'aime à mourir by Cabrel went straight to number one and became famous in other French-speaking regions as well. Later recorded in Spanish as well, the song has transcended France and the French language and become one of the greatest love songs of the 20th Century. Whether you're just learning French or you speak it fluently, these great French songs can inspire your language learning process or your love life. Many wonderful singers focus on love in their lyrics not only because it's a subject important to them, but because the audience always wants to hear a great love song. Learn the lyrics to these songs if you want to profess your love in a unique and romantic way; the lyrics are some of the best love quotes available in French.